The topic of Over-the-Counter (OTC) hearing aids has received significant attention since the passing of the OTC Hearing Act of 2017.1 The OTC hearing aids, along with the Personal Sound Amplification Products (PSAPs), fall under the umbrella of direct-to-consumer hearing devices (DCHDs).2 There currently is no regulatory guidance on the specification of OTC hearing aids, while the PSAPs are unregulated and are intended to provide moderate amplification in certain environmental conditions for listeners with no hearing impairment. Nonetheless, some PSAPs are marketed as “FDA approved” hearing amplifiers and are available for purchase by consumers regardless of their hearing status. A few research studies have assessed the electroacoustic and behavioural outcomes associated with PSAPs. Recent literature reviews* on this topic3,4 appear to support the following: (a) best-practice hearing aid fitting and verification approaches lead to better fit to prescriptive targets, which in turn leads to better audibility and better speech recognition; (b) some, but not all, PSAPs result in equivalent performance as hearing aids, even when self-fitted by the hearing aid wearer; and (c) not all PSAPs limit their output sound pressure levels to safe values. It is therefore imperative that the performance characteristics of PSAPs (and OTC hearing aids) are properly specified and verified before they are used by the listener. *The interested reader is also referred to articles by Humes et al. (2017), Reed et al. (2017), and Brody, Wu, and Stangl (2018). The first two studies are reviewed in the surveys by Jilla, Johnson, & Danhauer (2018) and Tran & Manchiah (2018), while the Brody et al. (2018) study was published very recently. At the National Centre for Audiology (NCA), we have expanded our electroacoustic and behavioural assessment studies of assistive hearing devices and their features, to include DCHDs. In a current ongoing project, we are assessing the performance of low- and mid-price range PSAPs, and contrasting it with the performance of basic and premier hearing aids. Figure 1 displays a selection of PSAPs that are amongst the “most popular” category for “hearing aids”(!) at Amazon.ca, and are currently under evaluation at our centre. Figure 1. Sample PSAPs from the “most popular” list on Amazon.ca, currently undergoing evaluation at the NCA laboratories. Consider PSAP #1, which is ranked at the top of “most popular” list for “hearing aids” at amazon.ca and is priced at $119.99. Sample electroacoustic measurements of this PSAP performance as specified in the ANSI/CTA standard are displayed in Table 1. It can be noted that the device generates greater internal noise and higher distortion levels for some conditions than those specified in the ANSI/CTA standard. In addition, even though the PSAP was marketed as possessing a separate noise reduction program, the magnitude of noise reduction in both programs of the PSAP was found to be negligible. 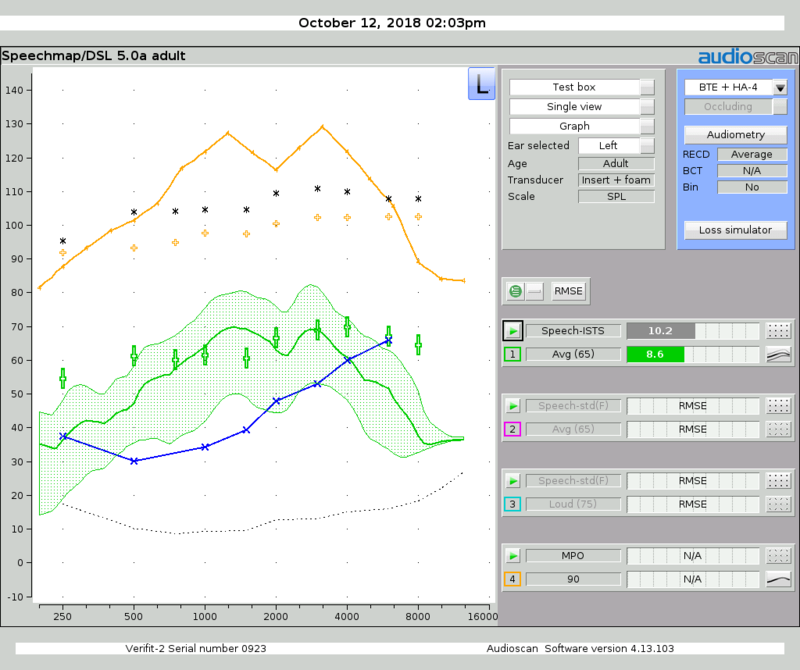 Figure 2 displays the Speechmap for this PSAP, where the PSAP volume setting was selected to provide the least root-mean-square error (RMSE) with the DSL 5.0 targets for the N2 audiogram (which exemplifies mild hearing loss).8 The same figure displays the Maximum Power Output (MPO), which can be seen to exceed the 120 dB SPL limit specified by ANSI/CTA standard at multiple frequencies. Figure 2: Speechmap for the sample PSAP along with the DSL 5.0 targets and thresholds for the N2 Audiogram. The PSAP MPO at the maximum volume control setting is also shown (in orange). Finally, Figure 3 displays the Hearing Aid Speech Perception Index (HASPI) – a perceptual correlate of speech intelligibility7 – for the PSAP in its quiet and noise programs. Figure 3 also depicts the corresponding HASPI values for a basic and a premier hearing aid. The HASPI values shown in this figure were calculated from the device outputs when the input was clean speech mixed with stationary speech-shaped noise at a signal-to-noise ratio (SNR) of 0 dB and presented at an overall level of 78 dB SPL. 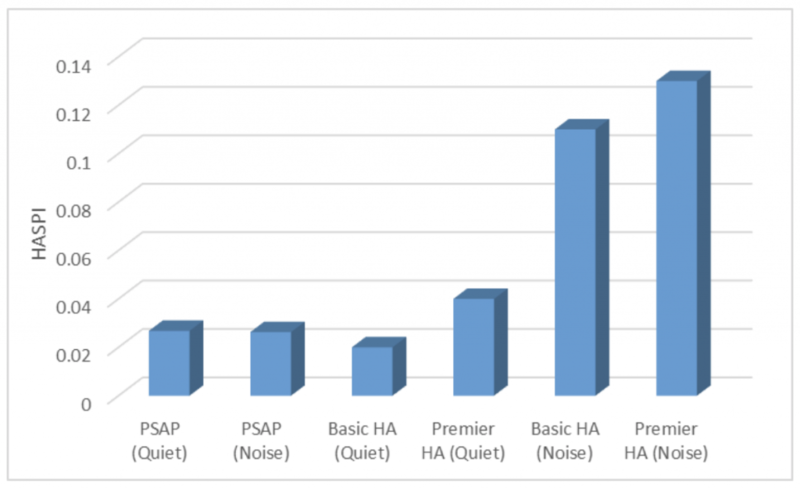 No discernable change in the HASPI value can be seen between the two PSAP programs, while both basic and premier HAs reported an increase in the HASPI value with the activation of the noise reduction program. Figure 3. Hearing Aid Speech Perception Index (HASPI) values for the outputs of the sample PSAP, a basic hearing aid (HA), and a premier HA, in quiet and noise programs for each device. See text for more details. The assistive hearing device landscape is changing with the availability of direct-to-consumer PSAPs, OTC hearing aids, hearables etc. Proper labeling and verification are important as these devices vary widely in their electroacoustic characteristics and performance. 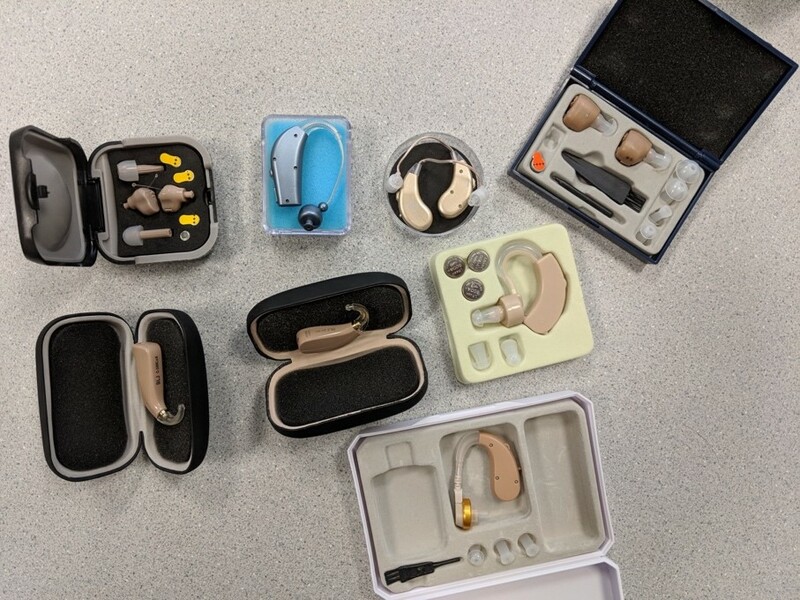 It is also important to raise consumer awareness on what entails in wearing such devices, and to emphasize the role of hearing health care professionals in ensuring benefit from amplification even from direct-to-consumer models. United States Government. FDA Reauthorization Act. Section 709; 2017. Available at: https://www.congress.gov/115/plaws/publ52/PLAW-115publ52.pdf. American Academy of Audiology. The audiologist’s guide to hearing aids, PSAPs, hearables and OTC devices; 2018. Available at: https://www.audiology.org/news/audiologist%E2%80%99s-guide-hearing-aids-psaps-hearables-and-otc-devices. Jilla AM, Johnson CE, and Danhauer JL. Disruptive hearing technologies and mild sensorineural hearing loss II: current research on affordable hearing technologies and direct-to-consumer models. Semin Hear 2018;39(2)146–57. Tran NR and Manchaiah V. Outcomes of direct-to-consumer hearing devices for people with hearing loss: a review. J Audiol Otol 2018;22(4), 178–88. ANSI/CTA Standard. 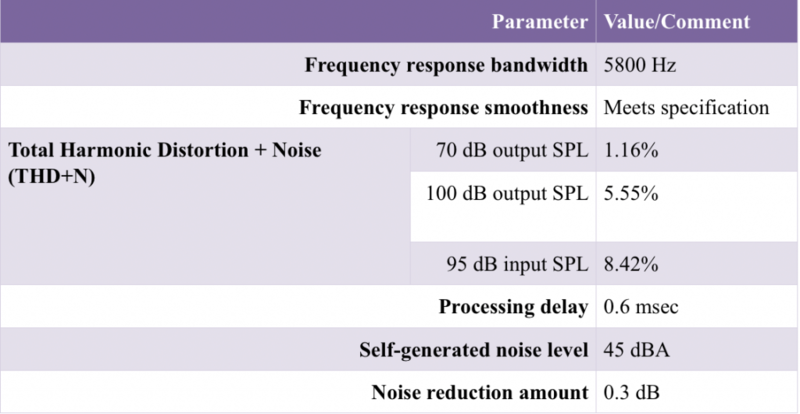 Personal sound amplification performance criteria (ANSI/CTA -2051). New York: Author; 2017. Falk TH, Parsa V, Santos JF, et al. Objective quality and intelligibility prediction for users of assistive listening devices: Advantages and limitations of existing tools. IEEE Signal Process 2015;32(2):114–24. Kates JM, Arehart KH, Anderson MC, et al. Using Objective Metrics to Measure Hearing Aid Performance. Ear and Hearing 2018; DOI: 10.1097/AUD.0000000000000574. Bisgaard N, Vlaming MS, and Dahlquist M. Standard audiograms for the IEC 60118-15 measurement procedure. Trends in amplification 2010;14(2):113–20. Vijay Parsa, PhD, PEng, is an Associate Professor at the National Centre for Audiology/Faculties of Engineering and Health Sciences, Western University. His research interests are in speech signal processing with applications to hearing aids, assistive listening devices and augmentative communication devices. Manan Sheel received his undergraduate (B.Tech.) degree from NITK Surathkal, India, in 2014. He is currently pursuing his MESc in Electrical and Computer Engineering at the Western University. His thesis work focuses on the electroacoustic evaluation of hearing aids and PSAPs, which is carried out at the National Centre for Audiology (NCA), Western University under the supervision of Dr. Vijay Parsa. Dr. Susan Scollie is an associate professor and the director of the Child Amplification Laboratory at the National Centre for Audiology, University of Western Ontario in London, Ontario, Canada. With colleagues, she developed version 5.0 of the DSL Method for hearing aid fitting. She collaborates with the Ontario Infant Hearing Program and the Canadian Infant Hearing Task Force to promote and deliver early intervention services for infants who have hearing losses. Her current research focuses on the efficacy of hearing aid signal processing, and outcomes for infants, children, and adults who use hearing aids.